Militants attacked a military checkpoint in Al-Wadi Al-Gedid governorate in southern Egypt on Saturday, killing 21 border guards, announced army spokesman Mohamed Samir. According to Samir, the slain were killed during an exchange of fire with the unknown gunmen which lead "to the exploding of the checkpoint's ammunition storage" which he says was fired at using rocket-propelled grenades. Another four soldiers were injured "in addition to the killing of some terrorists" said Samir. The army's statement added that two vehicles carrying ammunition and primed to explode, were confiscated at the scene and defused. An anonymous security source quoted by MENA had originally described the assailants as smugglers. According to Al-Ahram Arabic news website, the same checkpoint was targeted two months ago when five army conscripts and an officer were killed by gunmen. Al-Wadi Al-Gedid is a large governorate that borders both Libya and Sudan. According to MENA, the attacks took place at a checkpoint at the 100km mark on the road from Cairo to Farfara, a local town. 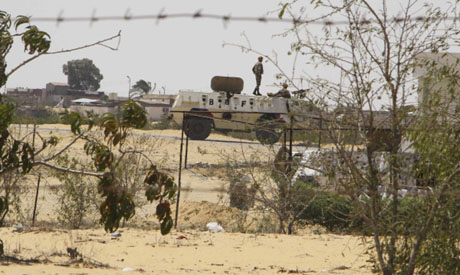 The attack was reportedly carried at iftar, the post-sunset meal when Muslims break their fast during Ramadan, resembling at attack in August 2012 in which 16 Egyptian soldiers were killed by militants in Sinai, close to the border with Israel, during Ramadan at the time of iftar. Saturday's attack is the biggest such single act of violence against army or police since last August when 25 police conscripts were killed near Sinai's Rafah. Militant attacks targeting police and military have been commonplace since the ouster of president Mohamed Morsi last summer amid mass protests against his year-long rule. Sisi is a foreign agent sent to divide Egypt and create a Syria type situation like Assad created. This attack further proves Sisi and his policy of politicizing the army must go. Separate politics and the army. It must be nice living in the dream world. Actually, based on your emotionally charged response, it must be torture being delusional. At least having criminal supporters such as yourself do mental acrobatics to try to justify their brainwashed support of evil, is actually quite satisfying. I'll shed 1000 tears for those massacred at Rabaa before I shed one for these "soldiers" whom you claim are defending Egypt but reality shows they're only destroying it. Those at Rabaa and elsewhere are the true defenders of Egypt. Only ignorant, delusional sheep like you believe in the false media campaign and propaganda. Sisi defend Islam?? That's just laughable. Thousands were martyred at Rabaa, and 1 billion more Muslims worldwide are willing to die to protect Egypt and the Ummah from you extreme terrorists! Morally Gen CC or Min of Defence must resign or must be sacked.This a criminal negligence of the border security.Army must secure the borders NOT to rule or involve in politics.Army is NOT for politics,if the Generals forgot their duty they must be sacked. Condolences. It is sad that due to politics, innocents are killed. President Al Sisi now has a historic opportunity and justification to bomb Sinai once for all for Egypt to prosper. This must not go unanswered. Let Israel take care of the other side. To eradicate these terrorists Egypt and Israel must come together , if leaders have to bend to uneducated masses the Sinai will become a biggest threat to Egypt.